Gene regulation is performed through several mechanisms by living cells to control the process by which the information encoded in a gene is converted into protein or some form of RNA (known as gene expression). The DNA sequence is first transcribed into RNA and then usually--but not always-- translated into protein. The regulation of a cell's genes determines which products it can make. Liver cells make loads of enzymes to break down drugs and toxins. Certain immune cells produce antibodies to help fight infections. Cells in a variety of organs—including the pancreas, brain, ovary, and testes—whip up hormones that are secreted into the bloodstream. Many of these substances are produced throughout life in response to the body's need for them. Others are made only at specific times, like the milk proteins produced in a woman's breasts after she gives birth. The pattern of gene expression also determines a cell's shape, allowing it to perform its job. For example, cells lining your small intestine have hundreds of miniature extensions (microvilli) used to absorb nutrients. Each sperm cell turns on genes needed to develop its wagging flagellum. Rod and cone cells in your eye express genes needed to form their characteristic shapes (cylindrical and cone-shaped respectively). The body even alters the balance of organelles in different tissues. Take your heart, for example. This incredibly durable machine is designed to produce the extraordinary amount of ATP energy required for nonstop pumping—it pumps 100,000 times a day, every day, for your whole life. To do this, it is made up of specialized muscle cells jam-packed with mitochondria. A human heart cell contains several thousand mitochondria—around 25 percent of the cell's volume. Cells that don't need much energy, like skin cells, contain only a few hundred mitochondria. 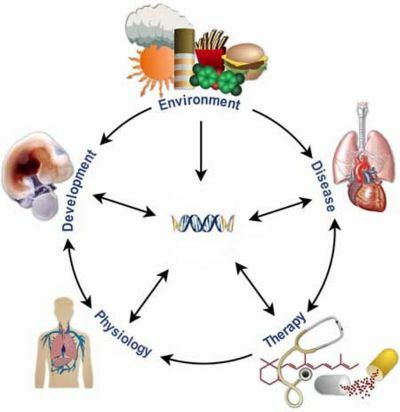 The regulation of expression system precisely controls the amount of a gene product that is produced and can further modify the product after it is made. This exquisite control requires multiple regulatory input points. One very efficient point occurs at transcription, such that an mRNA is produced only when a gene product is needed. Cells also regulate gene expression by post-transcriptional modification; by allowing only a subset of the mRNAs to go on to translation; or by restricting translation of specific mRNAs to only when the product is needed. At other levels, cells regulate gene expression through DNA folding, chemical modification of the nucleotide bases, and intricate "feedback mechanisms" in which some of the gene's own protein product directs the cell to cease further protein production. Transcription is the process whereby RNA is made from DNA. It is initiated when an enzyme, RNA polymerase, binds to a site on the DNA called a promoter sequence. In most cases, the polymerase is aided by a group of proteins called "transcription factors" that perform specialized functions, such as DNA sequence recognition and regulation of the polymerase's enzyme activity. Other regulatory sequences include activators, repressors, and enhancers. These sequences can be cis-acting (affecting genes that are adjacent to the sequence) or trans-acting (affecting expression of the gene from a distant site), even on another chromosome. Sequences that are important in regulating transcription do not necessarily code for transcription factors or other proteins. Transcription can also be regulated by subtle variations in DNA structure and by chemical changes in the bases to which transcription factors bind. As stated previously, the chemical properties of the four DNA bases differ slightly, providing each base with unique opportunities to chemically react with other molecules. One chemical modification of DNA, called methylation, involves the addition of a methyl group (-CH3). Methylation frequently occurs at cytosine residues that are preceded by guanine bases, oftentimes in the vicinity of promoter sequences. The methylation status of DNA often correlates with its functional activity, where inactive genes tend to be more heavily methylated. This is because the methyl group serves to inhibit transcription by attracting a protein that binds specifically to methylated DNA, thereby interfering with polymerase binding. Methylation also plays an important role in genomic imprinting, which occurs when both maternal and paternal alleles are present but only one allele is expressed while the other remains inactive. Another way to think of genomic imprinting is as "parent of origin differences" in the expression of inherited traits. Considerable intrigue surrounds the effects of DNA methylation, and many researchers are working to unlock the mystery behind this concept. Translation is the process whereby the genetic code carried by an mRNA directs the synthesis of proteins. Translational regulation occurs through the binding of specific molecules, called repressor proteins, to a sequence found on an RNA molecule. Repressor proteins prevent a gene from being expressed. As we have just discussed, the default state for a gene is that of being expressed via the recognition of its promoter by RNA polymerase. Close to the promoter region is another cis-acting site called the operator, the target for the repressor protein. When the repressor protein binds to the operator, RNA polymerase is prevented from initiating transcription, and gene expression is turned off. Translational control plays a significant role in the process of embryonic development and cell differentiation. Upon fertilization, an egg cell begins to multiply to produce a ball of cells that are all the same. At some point, however, these cells begin to differentiate, or change into specific cell types. Some will become blood cells or kidney cells, whereas others may become nerve or brain cells. When all of the cells formed are alike, the same genes are turned on. However, once differentiation begins, various genes in different cells must become active to meet the needs of that cell type. In some organisms, the egg houses store immature mRNAs that become translationally active only after fertilization. Fertilization then serves to trigger mechanisms that initiate the efficient translation of mRNA into proteins. Similar mechanisms serve to activate mRNAs at other stages of development and differentiation, such as when specific protein products are needed. This page was last modified on 23 April 2015, at 16:38.